I’ve become a bit of a dab hand when it comes to cheesy Valentine’s bakes. I recently made this loaf cake for work but couldn’t stop there so kept going with this Pistachio, Pomegranate and Clementine cheesecake. 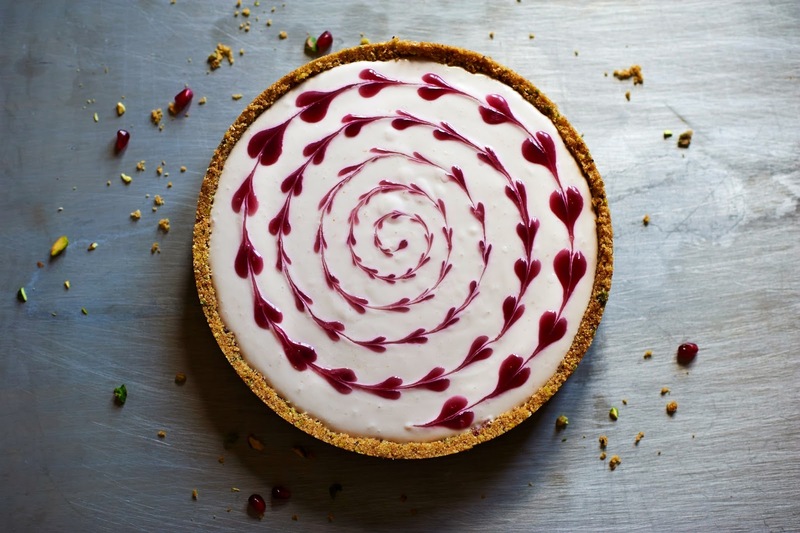 The swirly heart pattern is achieved by dotting blobs of pomegranate coulis on top of the cake, then pulling a cocktail stick through them. It’s a lot easier than it looks, but you will need a pipette or a syringe to get really exact dots. You can, of course, omit the hearts and simply serve the coulis on the side- also delicious. These gorgeous shots are courtesy of Faith Mason – photographer extraordinaire. 1. Mix the biscuits, butter and pistachios until well combined. Pack firmly into a loose-bottomed cake tin, spreading out with the back of a spoon so that it is evenly distributed and coming slightly up the sides of the tin. Chill until needed. 2. 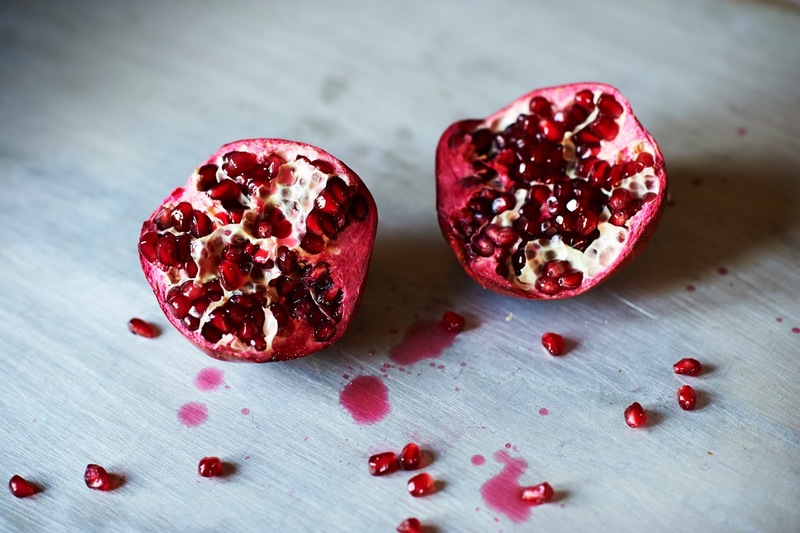 To extract the juice from the pomegranates, split one open then place in a large bowl of water. Working under the water, separate the seeds from the hard skin. Any bits of white pith should float to the top, making them easy for you to discard. 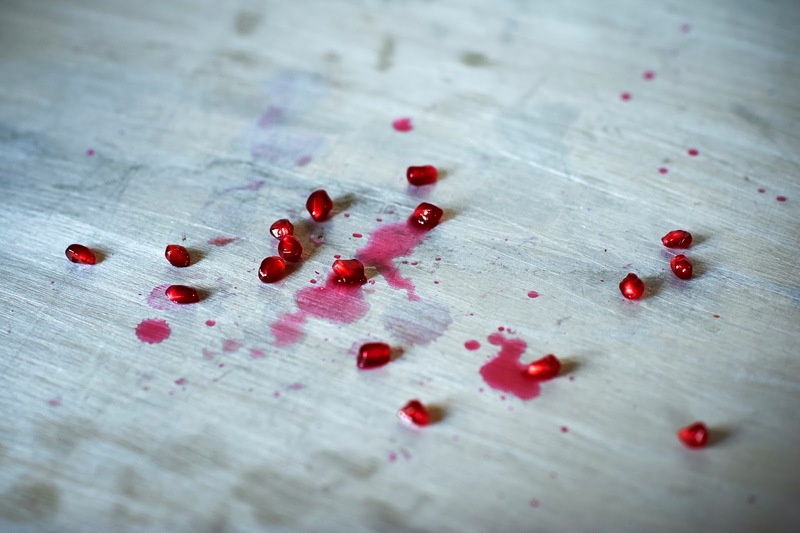 Drain the seeds and sort through to remove any extra bits of pith. 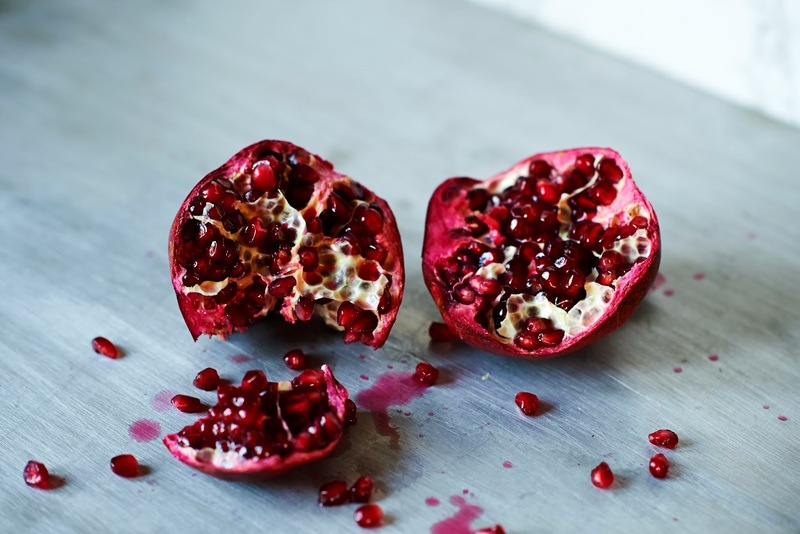 Repeat with the second pomegranate then place the seeds in the bowl of a mixer and blitz briefly. Strain the juice into a saucepan. Add the cornflour in water and sift in a few tbsp of icing sugar, to taste. Gently heat until you have a thick, but still drizzle-able coulis. Allow to cool completely. 3. Meanwhile, soak the gelatin leaves in a small bowl of water for 5 min. Pour the cream into a pan and bring to a simmer then remove from the heat. Squeeze any excess water out of the gelatin leaves and add to the warm cream, stirring until dissolved. Allow to cool slightly. Beat 100g of icing sugar into the cream cheese along with the clementine zest and juice. Add the gelatin cream along with 3tbsp of the pomegranate coulis and beat until smooth. 4. Pour the cream cheese mixture into the biscuit base. You are now ready to decorate- hope you have a steady hand! Starting in the very centre of the cake, use the pipette to dot tiny circles in a spiral motion all the way around the cake. I let my dots get bigger as I worked my way around. Finally, starting in the middle again, use a toothpick to pull through the dots in continuous line- try not to lift your hand up if you can help it! You should end up with a spiral of little hearts. 5. Cover the tin with cling (be careful not to touch the top of the cake!) and refrigerate for 6 hours or overnight, until set. Wow this looks beautiful too eat almost! 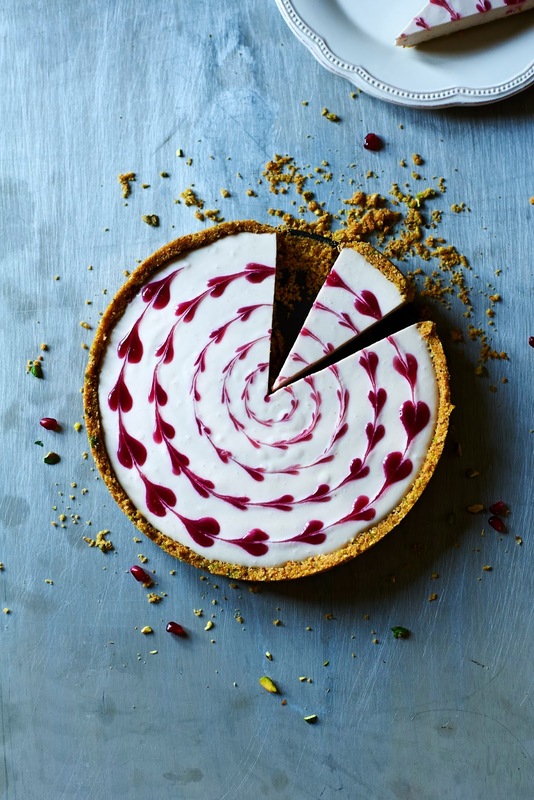 Gorgeous food photography! 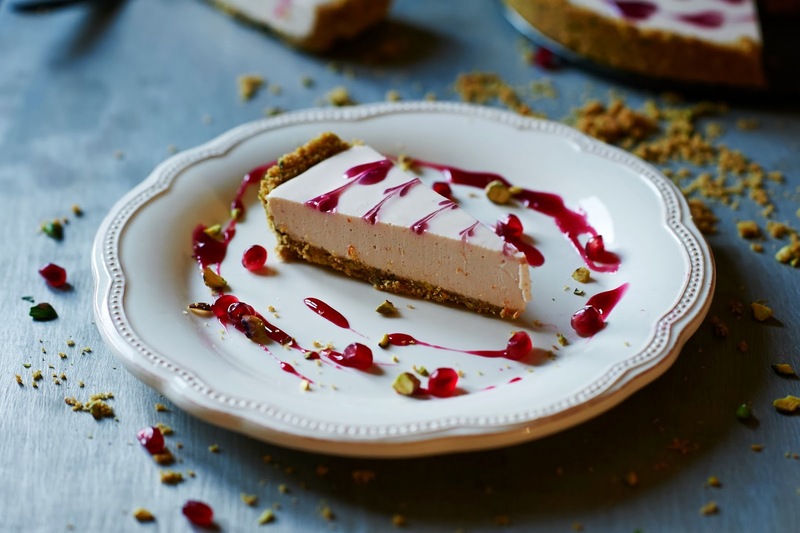 Pomegranates in cheesecake sounds amazing.